Nov. 17, 2016 – ADATA Technology, a leading manufacturer of highperformance DRAM modules, NAND Flash products, and mobile accessories today unveiled the SD700 durable external hard drive. The SD700 represents the first time 3D NAND SSD has achieved IP68 dust and water proof specifications in addition to military-grade shock proofing, all thanks to a tough protective enclosure and meticulous testing. The SD700 uses USB 3.1 Gen 1 to connect with Windows, Mac OS, and Android devices at speed read up to 440MB/s and write up to 430MB/s. In addition to being widely compatible, the SD700 is also very light, weighing just 100g for easy mobility. The SD700 will be available in 512GB and 256GB models, priced at £159 and £99 respectively. The SD700 has been designed and tested to IEC IP68 standards. That means it is completely dust-tight to prevent particulate ingress and can operate normally even after submersion in 1.5m of water for 60 minutes. ADATA has also tested the SD700 to the popular US Army MIL-STD-810G516.6 shock and drop resistance standard, ensuring a high degree of shock proofing. With its multi-layered protective enclosure and obvious lack of moving parts as an SSD, the SD700 offers extremely survivable storage for extreme activities. ADATA has been transitioning more products to 3D NAND, which is faster, more reliable, and more power efficient than traditional 2D NAND. The SD700 arrives in 256GB, 512GB, and 1TB at very competitive price points that deliver a better cost/performance ratio than older, non-3D NAND SSDs. For connectivity, the SD700 uses high throughput USB 3.1 Gen 1, more than enough to stream 4K content with no buffering or lag. Typical data speeds are read up to 440MB/s and write up to 430MB/s. The SD700 is plug and play compatible with Windows, Mac OS, and Android devices to best serve global audiences. Unlike most durable HDDs, the SD700 brings a new era of better mobility. It weighs just 100g, operates with complete silence, and does not build up any heat. 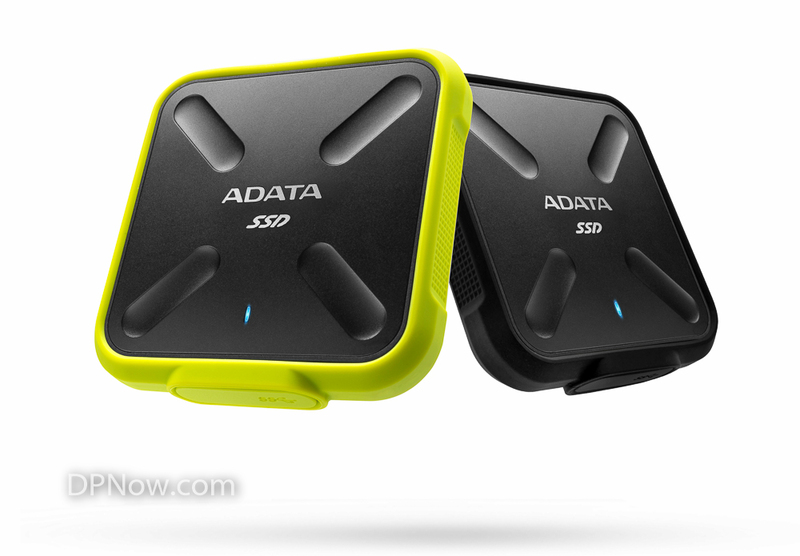 Additionally, ADATA is offering the SD700 in two-tone black and yellow or all-black color schemes.